For a traditional cabin owner, the outhouse is the most important room at the cottage. Regular service is the key to keeping it clean and family friendly. Outhouse maintenance is critical for ensuring that you and your guests can use the outdoor toilet comfortably. A few upkeep tricks is all you need to maintain a pleasant cottage privy. While outhouses have a bad reputation, there is no reason that using the outdoor “sanitary pit privy” should be a traumatic experience. In fact, if maintained properly, it is much more practical than an indoor toilet for many cottages and cabins. You can do yourself and your guests a great service by simply paying attention to the little daily maintenance details. There are a few important items that should be found in every outhouse. When the privy is set up properly, your guests will be much happier. Hang a little sign on the inside of the door to politely remind your guests about the privy rules. Be specific about what doesn’t go into the pit. It is better to let people know than to leave it up to their own judgement, especially for guests who are not familiar with outhouse etiquette. This one is decorative and sends part of the message in a delicate way. You may want to add a few extra points. Here is a fun sign to place above the rules if you decide to post your own customized message. Install a small garbage pail with a lid and a plastic bag for all non-natural material. If you are really focused on being green at the cottage, this would include the toilet paper. Empty it daily into the main garbage to be taken to the transfer station when you head home. If the only waste that goes in the hole is natural, the breakdown process works much more efficiently. We found this touchless version that might do the trick. Install a battery-operated push-button light within reach of the seat. If you want to go hi-tech you can install one that has a motion sensor. This is more practical than struggling with the flashlight when visiting the loo at night. Again, your cabin guests will appreciate the gesture and it may save you the unpleasant experience of rescuing someone in the middle of the night. The light below has a motion sensor and is a good choice for an outhouse or work shed. These in-ground lights are a great option if you need to light up the path to the outhouse. Add a bottle of alcohol-based hand sanitizer or install a touch-free dispenser on the wall. Be sure to keep it full and clean. Your guests will appreciate the gesture. Hang a small mirror on the door or the inside wall of the privy. People still like to powder their noses at the lake. Install a magazine rack or small box as a magazine holder and add some reading material for those people who prefer to educate themselves while in the privy. Remember to organize the books once in a while and clean out any critters that have taken up residence in the rack. Here is a classic book about the history of outhouses that makes great privy reading material. The book contains lots of pictures for those of us who just prefer to flip through the pages. 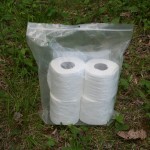 Keep the extra rolls of toilet paper in a sealed plastic bag or plastic container. This protects the toilet paper from becoming damp and keeps out spiders that like to make their homes inside the rolls. Your cottage guests will also feel more comfortable. Install a coat hanger on the inside wall beside the door. When the weather is cold, rainy, or when the bugs are bad you will be wearing extra layers of clothes that may need to be removed. The outhouse floor is the last place your guests want to place a jacket or hand bag. 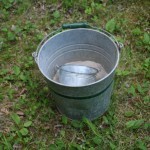 Keep a small bucket with lime or wood stove ashes inside the outhouse. Use a small scoop to scatter some of the lime or wood stove ashes into the privy after every use. This helps reduce both the bad insects and the nasty odours while aiding the decomposition process. This one is inexpensive and comes complete with a lid and a small shovel. Place a new air freshener in the corner every week. This really helps during the more humid days of July and August. Here’s an interesting invention that is great for the cabin toilet whether it is inside the living area or located in the bush. Always check the seat and the paper roll for unsuspecting inhabitants. Even a conscientious cabin owner can’t always keep up with the wildlife, so it is always best to take a peek before you settle in. This will avoid a stressful encounter for both you and the critters. Never put personal sanitary products in the outhouse pit. They will not decompose properly. Owners should go over the rules with their guests, but it is always a good idea to ask up front. There should be small garbage pail available in the privy. Most cottagers put toilet paper in the privy but it is best to check with the owners. If you want to have a smoke in private, the outhouse is not the place to do it. Go for a walk down to the dock or the shoreline instead. Remember to always place cigarette butts in the garbage. They do not decompose. Keep the structure in good repair. Seal any cracks that may allow flies and other bugs to enter the outhouse. Inspect the ground around the base of the outhouse for new burrows or holes created by the animals. Patch or replace any boards that have been eaten through or rotted. Regularly inspect the methane gas exhaust pipe to make sure it is not partially or completely blocked by bugs, critters, or leaves. Use a fly trap to catch flies while you are away during the week. You can remove the trap when you return on the weekend or before your guests arrive. Never dump bleach into the privy. It kills all the good bugs that are necessary to break down the waste. Clean out the hole in the spring before you start to use the outhouse. This avoids any overflow issues during the summer which can be both unpleasant and embarrassing if you are entertaining a big crowd. Go to the How to Clean Out or Move an Outhouse page to get information on the best ways to deal with a full outhouse or sanitary pit privy. A camping toilet is a great idea for cabin owners who have an outhouse. It can be kept inside the cabin and used at night or during days with bad weather when you don’t want to brave the elements. It is also essential when you plan to clean out or move the outhouse. This one is both affordable and practical for cottages and guest cabins. Consider converting the outhouse to a composting toilet.